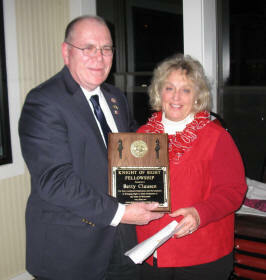 Tom and Betty Clausen received the prestigious fellowships at a recent Fond du Lac Evening Lions meeting. The Knight of Sight Fellowship was presented to Betty by the club for her continued support to club activities, fund raisers and participating as a Lions Eye Bank Tissue Transporter. A Knight of Sight Fellowship is awarded by the Lions Eye Bank of Wisconsin upon receipt of a $1,000 donation by a club or an individual to the Eye Bank's operating fund. Betty has been a member of the Fond du Lac Evening Lions Clubs for 14 years and has served as president of the club. Presenting the fellowship to Betty Clausen is Phil Weber, Director of the Lions Eye Bank of Wisconsin and also a transporter for the Sherwood Lions Club. Other FDL Evening Lions that are Knight of Sight Fellows are Wayne Bargenquast, Frank Bartzen, Tom Clausen, Gary Colton and Erv Karls. Tom Clausen was also presented with a Ray Hempel Fellowship the same evening. A Hempel Fellowship contribution of $1,000 by his club will be deposited into the permanent Lions Pride Endowment Fund where interest earnings will help support The Wisconsin Lions Camp and other Wisconsin Lions Foundation statewide projects both today and tomorrow. The Lions Pride Endowment Fund is "Today's Help, Tomorrow's Hope," contributing annually to the WLF, while protecting the contributed principal, ensuring the lasting legacy of service, that began with Lion Ray Hempel's vision of Wisconsin Lions Camp. Hempel is credited with starting the Wisconsin Lions Camp in the mid-1950s. His story can be read on the Lions Pride website at lionspride.org. Pictured are Tom Clausen, president of the Fond du Lac Evening Lions and former president of the Wisconsin Lions Foundation which operates the camp and Gary Colton, a past president of the club and now the vice president of the Birch-Sturm Memorial Fund which also supports the operation of the Lions Camp. 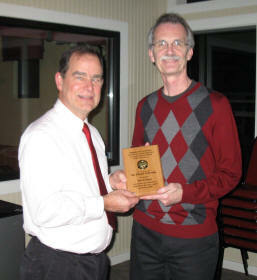 Clausen is the first Fond du Lac Evening Lion member to receive this new fellowship offered by the Wisconsin Lions.